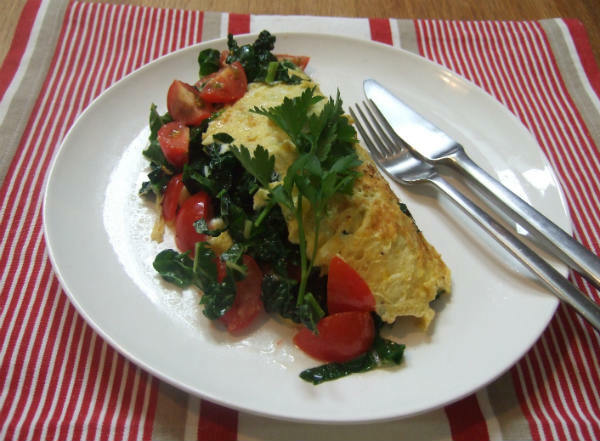 This omelette makes a great breakfast or lunch or equally a great dinner! Eggs are rich in protein and when combined with vegetables, give sustaining energy. So an omelette at breakfast sets me up for the day really well. And best of all, it tastes amazing! Omelette- folded over and served onto the plate, yumm! Mix the eggs with 1 tablespoon of water, a grind of salt and pepper. Chop the green leaves and tomatoes. Place a tablespoon of olive oil or coconut oil to heat in a fry pan. Pour in the egg and spread over the base. Allow it to start cooking on a medium heat, for about 1-2 minutes. Once you see the egg start to set, spread the vegetables over the egg and cook for another 2 to 3 minutes until the green leaves have slightly wilted. Carefully, using a large spatula or slice, loosen the omelette from the base of the pan and fold over in half.